Hello friends ! today we are going to share you a awesome trick that is very important to all of us. F.lux takes care of the problem of different looking monitor screens during the day and night. If you use a Windows PC at home, whether desktop or laptop, you probably use it throughout the daytime and into the evening then this trick is so useful to you. This trick will help you. It makes the color, brightness of your computer’s display adjust automatically to the time of day, warm at night and like daylight during daytime. This application has a pretty self-explanatory name: it is designed to automatically adjust the monitor’s brightness level according to the current time of day. Personally, we have even started to experiment with the “Day” color. If I manage to adjust the color such that it would reduce the daytime strain on my eyes then it would be doubly useful. 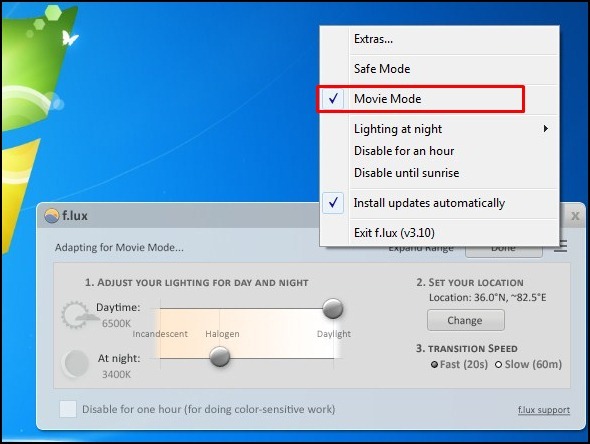 Have you ever thought to adjust your computer screen brightness based on any time of the day? If your ans is no then you need to think because using the computer on the regular basis is actually damaging your eyes. There is a super tool that will help you about this problem. The tool or software name is F.lux. This software has many feature that you need to know cause you are going use this software. You can also control the transition of your screen brightness in the transition speed settings: fast or slow. This tool makes you sleep better and protect your eyes from the bright screen. You can also set up the color sensitive work environment on your PC screen. This app change screen brightness best according to the room light like in sun time screen brightness will be maximum, and at night, it will be reduced accordingly. You can setup settings according to your GPS location like in particular GPS location. Steps to setup the software. At first you need to download the software and install it. You can download it by simply click here. Now launch the software on your computer. Now it will automatically detect the time and geographical location and will best set your screen color. You can Adjust the Lightning for day and night. if you want to do color sensitive work then you can uncheck the Disable for one hour option. There is some interesting option in this tool such as movie mode and many more and you can also set the movie mode. After doing all of this steps your computer will adjust brightness and color automatically according to time and geographic location . Hope you like it.